68 cities recently took part in Jane’s Walk, an annual weekend of free walking tours honouring the vision of urbanist Jane Jacobs. Ordinary people, Jacobs argued, can learn about and improve their surroundings by observing their daily environments at street level. These walks also bring out the histories of place through members of the local community – walk leaders and participants. Two members of ActiveHistory.ca partook in walks in different Canadian locales and have reflected on their experiences. Jay Young followed a buried creek in one of Toronto’s vibrant neighbourhoods, while Ian Milligan walked through Vancouver’s Lower East Side. “Garrison Creek: Exploring Its Natural and Cultural History”, a walk led by city council candidate Karen Sun, traced the path of one of Toronto’s enigmatic long-lost rivers. The creek, an important element in the city’s development during the late eighteenth and early nineteenth centuries, was buried by the city in the 1880s amid public health concerns. At the time, inhabitants upstream used the creek as an open sewer, dumping refuse and leading those living downstream to demand the city bury the creek. The most fascinating part of the walk was how the tour literally unearthed the creek within the walking group’s consciousness. In an earlier post, I remarked how recent media attention linking Toronto’s leaking watermains to the city’s infrastructure history suggested that a sense of the history of public works emerges when its use is disrupted. The Garrison Creek trek indicates that a walk along the path of buried infrastructure – drawing on all of our senses – is another way in which we recognize the tunnels, pipes, and past below us. After learning the creek’s course at the start of the walk, one participant asked “is that why our basements are so wet”? The most poignant moment of the walk occurred in Bickford Park, when walkers could see, hear, and smell the creek through its sewer grates. “I thought it was a dead animal,” remarked one woman after smelling the creek’s pungent odour. The tour began at the foot of Christie Pits, site of not only Toronto’s first gravel pit for road construction but also a 1933 anti-Semitic riot recently commemorated with a Heritage Toronto plaque. Multiple layers of history intersect through specific spaces, which is one of the many reasons why walking draws out the diverse histories of place. The walk also uncovered the impacts that the creek had on the city’s built environment. 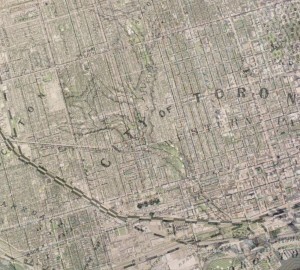 For example, much of downtown Toronto lacks green space, but the walk illustrated how development challenges imposed by the creek’s path led to the creation of a string of parks that follows the buried creek. And while most of the city built before World War Two conforms to a grid pattern, we experienced how the creek broke this pattern at certain locales, as illustrated through such curvilinear roads as Crawford and Niagara Streets. We ended our hike at Fort York, where the creek once ran into Lake Ontario and provided drinking water to the garrison. The Fort – now surrounded by rising condominiums of green and blue glass, a spider web of railroad tracks, and one contentious elevated expressway – was a fitting place to end; it once again demonstrated that the history of urban development cannot be separated from its natural history. 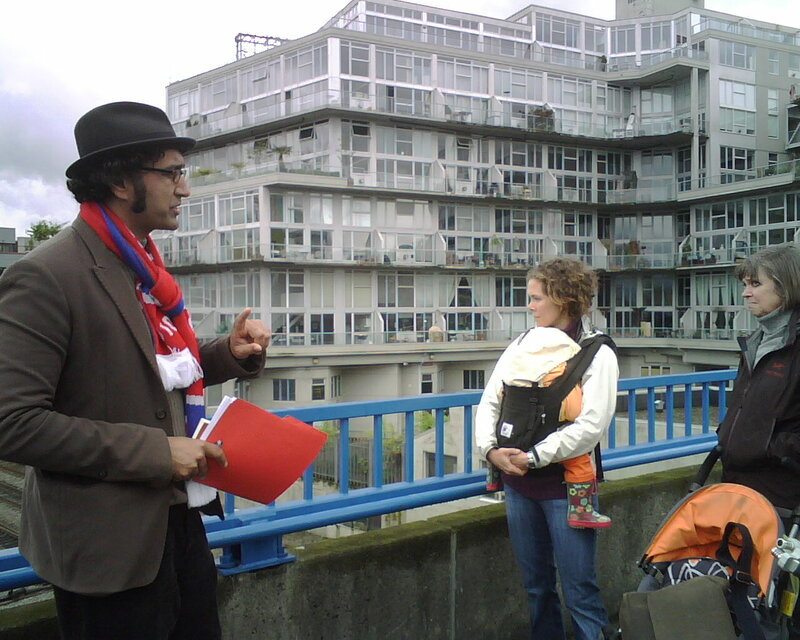 On the other end of the country, I was able to attend a Jane’s Walk in Vancouver: “Labour History in the Downtown Eastside.” Led by local community activist Am Johal, the walk took us through and around one of Canada’s most economically depressed areas. This, however, can overshadow a rich historical heritage of working people. Am combined narratives of local and oral history from his work with work by Derek Hayes (Reading the Riot Act) and Bill Waiser (All Hell Can’t Stop Us: The On-To-Ottawa Trek and Regina Riot). It was great to see the melding of professional and local history in producing a rich and vibrant walk and talk. It must be noted that I knew very little of this local history before stepping out onto the walk, so this was all very new to me! 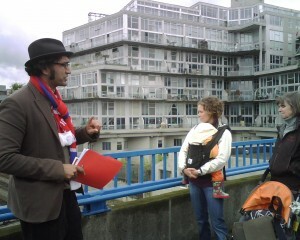 We began on the Main St. overpass over the rail tracks leading into downtown Vancouver. It was here that Am told the story of how Great Depression-era workers established unions in their relief camps, culminating in a large march and the infamous On-to-Ottawa trek, which was tragically stopped in Regina. The memory of this event is still alive in the community and will be commemorated with a plaque on June 6th when another On-to-Ottawa trek will launch from the same site. The marchers, to be joined by two surviving members of the original 1935 event, are set to push for a national housing strategy. We then passed near the site of the Battle of Ballantyne Pier, where longshoremen at Vancouver’s port are planning to establish a public art project to commemorate the battle, another example of how the community continues to engage with the past. While walking, we discussed the varying narratives of the Frank Rogers shooting – the community narrative, which prevails among residents today, as opposed to the narrative of the heavy-handed Vancouver police who shot Rogers. A darker side of the history came up as well: the anti-Asian riots of the early 20th century, where many trade unionists and working people assailed Chinese and Japanese immigrants for their low-wage position in the labour market and occasionally acting as strikebreakers. From there we moved through Oppenheimer Park, former home of the Japanese-Canadian baseball team the Asahi Tigers and site of International Workers of the World rallies. In the core of the downtown east side itself, we learned about the single-residency hotels (SRO), home to many lower income residents today, and how they developed out of working people’s historic need for temporary accommodation while in Vancouver on leave or on lay-off from their jobs in shipping or forestry. Finally, we ended with the story of the Downtown East Side Residents Association, which brought a form of bottom-up rank-and-file unionism to the community. The name itself, I learned, was consciously chosen to erase the stigma of the former community name, ‘Skid Row.’ Even today the Association is strong, and has made the area a hub of organizing and resistance to megaprojects such as the 2010 Vancouver Olympics. Standing at the corner of Main and Hastings, I realized the value of such a poignant walk, tying the historical struggles of working people into the neighbourhood as it is today. When people think of the Downtown East Side, they think of extreme poverty and drug use. This narrative, while true in many respects, needs to be contextualized and can be seen as part of a broader narrative of working people’s fights, struggles, and historical existence.